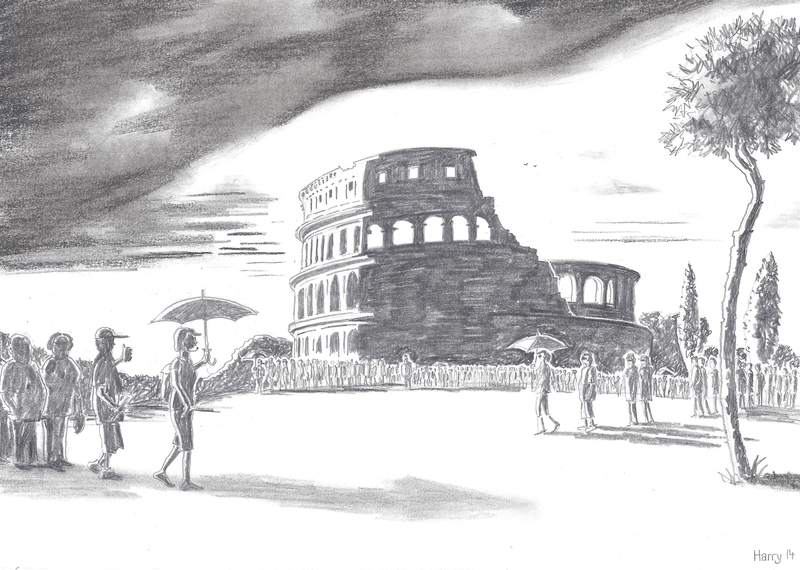 You’d think a village in Somerset would be the last place Italian con men would operate in – but the other day Harry Mottram almost fell for a scam that is more common to the streets of Rome than Cross near Axbridge. I was crossing the road to the New Inn at Cross to deliver magazines when a white sporty looking new car pulled up. Inside were two prosperous looking well fed Italian men (they introduced themselves as Italians). They asked for directions to Gatwick saying they were lost – I showed them the route on their map and in thanks they immediately handed me what appeared to be a Rolex watch. They insisted I have it as a thank you – but I tried to hand it back. They then thrust a second watch into my hands saying it was for my wife. Again I tried to give the watch back – and then they said as they had given me a watch could I lend them cash for petrol as their card wouldn’t work at a cash machine. I smelt a rat and threw the watches back through the window of their white sports car. Brenda said that normally the gift bearer demands more than a token for gas (after all, he gave you such nice things) and once the duped tourists walk away with their jacket and handbag, a motorcyclist quickly rides up and grabs the stuff so it can be reused on the next victim. Ironically I played the spiv in the Axbridge Pageant in 2010 – and performed a comedy show entitled Harry The Spiv at the Roxy in the town based on an incompetent dodgy black marketeer. 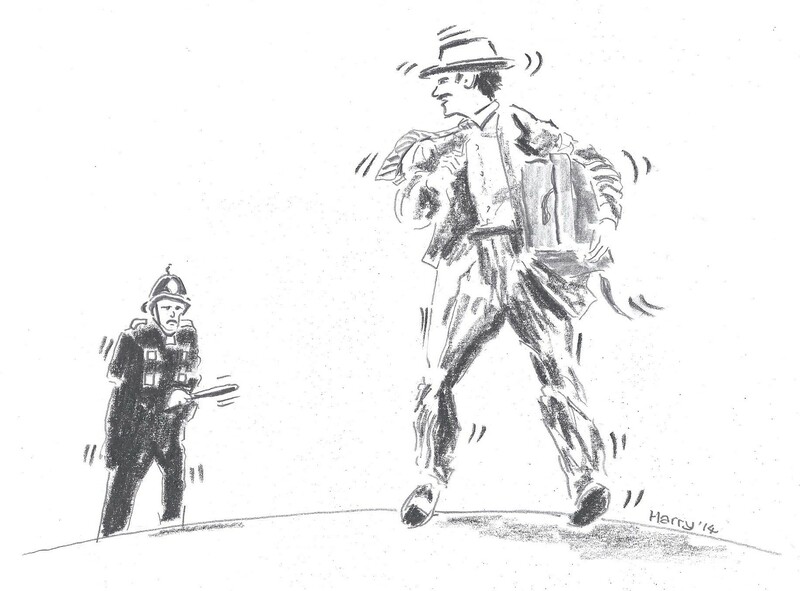 Judging from these stories – incompetent spivs are not as unusual as you might think. All I can say is thank goodness I didn’t fall for the scam in Cross – I might never have been able to live it down. Is George Orwell right about making tea or does the University of Nottingham have the know how? Harry Mottram has a brew up in search of the perfect cuppa. It has led to family arguments, marital bust-ups and even war. How to make a perfect cuppa has exercised the minds of the great, the good and countless maiden aunts since the leaf-based beverage was first sipped in England in the 17th century. George Orwell identified the reason in his essay on the subject in 1942. The author of 1984 said there were 11 rules – but only two were universally agreed and a further four were highly controversial. Having read his article I suggest none of his 11 points are widely accepted – and some could lead to legal action in the kitchen such are the passions raised. And that’s the point – nobody appears to agree on any of the main steps in making a perfect cup of cha, char, te, tai, herbata or tea. Ask anyone you know and they all have their own idiosyncracies and often family traditions. I’ve known people to throw away a cup of tea in front of the person who has made it and then declare they’ll make it themselves. It’s one of the most insulting things you can do – and yet who can honestly say they’ve never tipped away a cuppa made by someone and quietly made it again – their way. To start with there’s a variety of tea. My late husband (who would declare several times a day that he was dying for a cup of Greyer’s as he called it) would only drink Earl Grey – and sadly it was the reason for his untimely exit from life’s fragile existence. He was run over crossing the road to a café in London where he knew they served Earl Grey. Personally I only drink Builder’s – as I call it. Strong, Assam, with milk, from a tea bag and with four sugars. I know George Orwell wouldn’t have approved of that. 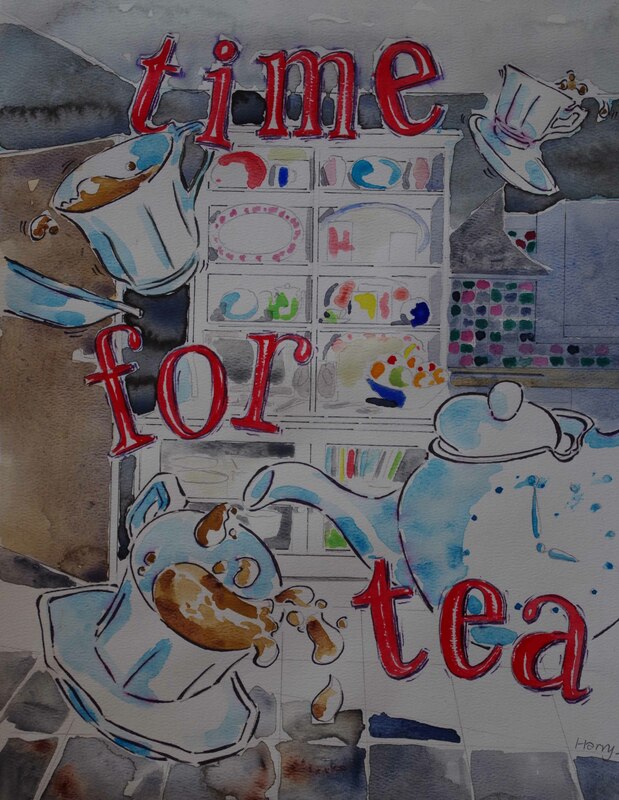 He said tea should never be sweetened – something my occasional friend Mrs Pople would agree with. Builder’s of Earl Grey? A simple choice – but of course there are numerous others including black, oolong, green, yellow, white and pu-erh. Next is tea bag or loose leaf? I never use tea bags – although the quality has improved and I admit you can get a decent cuppa from teabags – as long as the tea is good quality. Almost all cafes and tea rooms serve tea in tea bags – dropped into a small pot and provide you with all the necessities such as milk and sugar allowing you to serve yourself. Even some public houses serve tea these days – something which I think is a great improvement. By and large the standard of tea served in the tearooms of England these days is good to excellent – except for one exception and that are motorway service stations where a sort of luke warm stewed tannin is the order of the day sold at £2 a cup – the same price incidentally for they pass off as tea at Bristol City’s football ground. So, having established the tea you want, you must decide on the temperature of the hot water. Boiling or 80C? Call me old fashioned but boiling soft water is best – and the tea pot should be warmed first – very important. Pour in the boiling water straight into the pot and allow it to stand for two minutes and fifty five seconds. The University of Northumbria spent considerable time on researching the amount of time you should allow tea to brew. They reckoned on 17 minutes and 30 seconds. However after more research the boffins concluded that the best method was to add boiling water to a tea bag in a mug and leave for two minutes. You should they said then remove the bag and add the milk and leave for six minutes until it reaches optimal temperature of 60C. Leave too long and it drops below 45C and the flavours destroying the “all round sensory experience” – said the white coated ones. Apparently the average time we allow it to brew is 40 seconds. A scandal – that allows for no real taste to emerge from the leaves. Two minutes and 12 seconds is my recommended time for brewing for a tea bag but for leaves, two minutes and 37 seconds is best. If there’s not a drought then always boil fresh water (even George Orwell agrees with that one) Dr Andrew Stapley of Loughborough University said: “Use freshly drawn water that has not previously been boiled. Previously boiled water will have lost some of its dissolved oxygen which is important to bring out the tea flavour.” So there. One rule given by George Orwell which must be challenged is: “After making the tea, one should stir it, or better, give the pot a good shake, afterwards allowing the leaves to settle.” Shake a tea pot? Give it a wiggle maybe – but don’t stir – leave nature to take its course. I was once last in the marathon. It was held in Taunton in Somerset and to the sounds of the theme music to The Chariots of Fire we set off in a mass start outside the local technical college. I quickly found myself near the back as most competitors were very keen and apart from a man dressed as a parrot I appeared to be the only person in fancy dress. 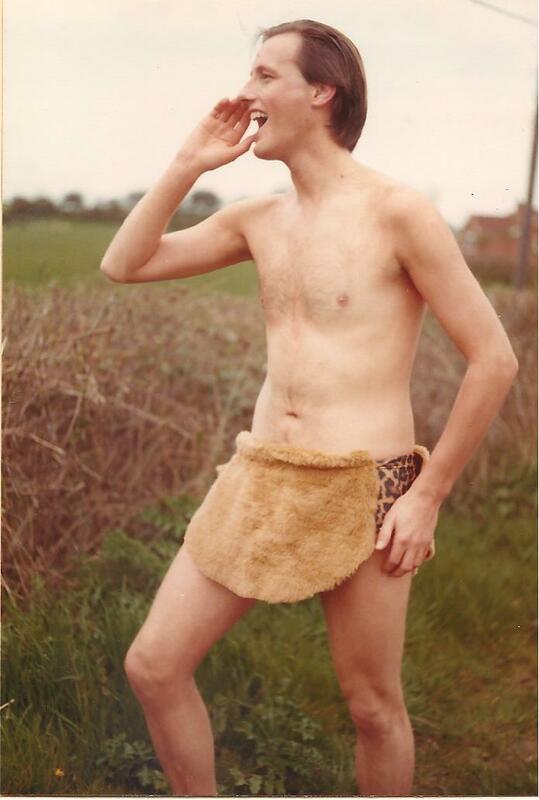 Dressed as Tarzan I had covered myself in brown make-up, slicked back my hair and sported a makeshift loincloth. Unfortunately I couldn’t do much to pump up my biceps, rustle up a vine, recruit a troop of apes or speed date a Jane in time for the race. It was a hot day and soon my make-up began to run down my legs turning my socks and trainers a dark brown colour. I jogged along watching the other runners disappear into the distance although I was still ahead of the parrot. After a few miles I was bursting to go to the loo. With no toilets in sight desperate action was required. I stopped by a house where a family were cheering the runners on from the garden gate. “Excuse me but could I use your toilet,” I said to a middle-aged man who I judged to be the owner. Along with the rest of the family I followed him up the garden path to his 1930s semi, and in through the front door. He stopped with me close behind him in the hallway and the various family members forming a semi-circle behind me. Brown make-up was oozing down my legs, through my socks and down my trainers onto the carpet. “Oh,” I said, now feeling that agony that happens when you really are bursting. He was cut off. “Yes, yes,” said Dad, “but just look at the downstairs loo.” And to illustrate, he opened the door. “Lovely,” I gasped and entered. The family stood and watched me as though expecting me to drop my loincloth and have a pee in front of them whilst continuing to admire the décor. It was like a scene from one of those toilet dreams where you want to go but you are sitting on a toilet – but it’s in the middle of Wimbledon’s Centre Court – and you can’t go. My mind became blocked. The marathon, the Tarzan costume, the brown make-up, the family and proud DIY dad. The door closed, and I looked at the newly decorated loo. Outside I could hear the family seemingly waiting in triumph to hear the sound of pee splashing into the toilet bowl. But, they didn’t. I couldn’t go. I flushed the toilet, made my excuses and sprinted down the garden to join the rest of the runners in a steady squishing of brown make-up in my trainers. Except they’d all gone. I ran on for several hundred yards but there was no one in sight – even the parrot had disappeared. I slowed and realised I was still bursting to go for a pee but saw in the distance a group of friends outside the World’s End pub. Phew. A visit to the gents and relief. Then a double whisky and onto the finish and… last place with a time of five hours and fifty five seconds. I can account for the five hours. But the fifty five seconds must have been the excruciating time spent in the newly decorated toilet. There’s more at http://www.harrymottram.co.uk/?page_id=20 – follow Harry Mottram and Harry the Spiv on Twitter and Facebook, LinkedIn, YouTube and God knows where else. Batty old bag ladies are few and far between on stage but there’s always a role for dotty eccentrics or a mad women on television. Eastenders has the mentally deranged Jean Slater (Gillian Wright), in Emmerdale there’s the odd retro thowback Edna Birch (Shirley Stelfox) and Coronation Street has featured bossy and slightly unhinged Sylvia Goodwin (Stephanie Cole). Shakespeare, Shaw and Wilde all knew the importance of an off-their rocker battle axe – great protagonists, plot changers and good comedy. Plus of course there’s a universal recognition of the old bat amongst the audience. We all know one. But bag ladies… that’s a different matter. On stage you have to search long and far to find the female down and out – which is why The Lady In the Van is a curious success. Alan Bennett describes the eccentric Miss Shepherd (Nichola McAuliffe) in his play The Lady in the Van as “a bigoted, blinkered, cantankerous, devious, unforgiving, self-centred, rank, rude, car-mad cow”. Ouch. But she’s also rich material for a writer. After all she’s delivered herself and her van world as a gift to the comic playwright. There in front of him is one of life’s great nutcases. Not mad, not dangerous – just irritating and smelly. Should he exploit her as a subject for a drama or should he get the police to evict her from his front garden? The play is based entirely on the debate – and his experience of having the old bat invade his life. 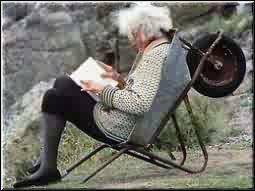 She claims she’s a trained concert pianist and may have been a nun but lives illegally and uninvited in Bennett’s garden in her dirty old clothes and her grubby opinions. And yet the playwright doesn’t have the heart to kick her out. Instead he gets his revenge by turning the Lady In the Van into a comedy. In her symphony of dirty rain coats and odd hats Miss Shepherd’s voice (Nichola McAuliffe) is a mixture of old drains, Home Counties and nettle tea. Clear but unclean, posh but pushy – and with every sentence having a sting in the tail. Miss Shepherd comes from a long line of eccentric female protagonists who have lugged their plastic bags and bundles of precious possessions onto the screen, page or stage. And if they don’t have bags of rubbish to push around in supermarket trolleys then they stay imprisoned in their pasts, cooped up in self-imposed prisons and the queen of such ladies is Miss Havisham in Charles Dickens’ Great Expectations who is “like a cross between a waxwork and a skeleton, with moving eyes.” Jilted on her wedding day, Miss Havisham has many of the hallmarks of the bag lady. She can’t move on, she wears the same old clothes – in her case her wedding dress – and she has a cruel and manipulative streak. Fascinating and repulsive at the same time, actors have queued up to play her. From Florence Reed to Jean Simmons and from Anne Bancroft to Charlotte Rampling, the larger than life manipulator of Pip and Estelle’s lives continues to fascinate. Her persona even has echoes in Sunset Boulevard’s Norma Desmond or Baby Jane Hudson in Whatever Happened to Baby Jane? Audiences find the lost pasts of these women eternally fascinating – how did they become that pathetic person? And for writers there’s something wonderful about an eccentric – they don’t conform to the usual rules of characterisation. Like a child they can have tantrums, insult people and have sudden impulses – all of which have the neat benefit of moving a story on, creating a twist in the plot or producing drama out of nothing. And there’s something else that attracts audiences: we all have met one, have one in the family or even stepped over one lying in the street to get to a cashpoint. They are familiar but not over familiar. Like children who see a drunk in the park we are at once fascinated and repelled. How far are these portrayals accurate? Are we just watching caricatures of sad and pathetic women descending into old age? Are they simple two-dimensional versions of broken and damaged females one step away from being sectioned? In Jeremy Sandford’s 1971 BBC Play For Today Edna, the Inebriate Woman Patricia Hayes gave a rounded portrayal of an elderly woman, who wanders through life in an alcoholic fug without a real life. In a brutally honest film about the life of a real down and out we meet a rambling, pathetic but defiant woman who sleeps rough and begs for food and money. Despite being shunned by society and being at times a complete pain we warm to her and sympathise with a person who cannot cope with life. Unlike Bennett Sandford spent time sleeping rough himself so as to get under the skin of his character – and get a feel of how she is treated by the authorities. His viewpoint is from beneath the bags and the bit of old carpet – rather than from a window overlooking the heap of humanity. Other portrayals include van Itallie’s off Broadway 1970s production of his play Bag Lady in which a woman becomes a sort of New York philosopher pondering on the nature of material goods, society and the future of mankind. There was Mark Callum’s 2011 The Bag Lady in which two people from opposite ends of the society inadvertently get to understand each other over a casual conversation. These small scale dramas are perfect for studio theatre with their immediately identifiable protagonist, clearly defined costume and setting. Male down and outs seem to come off a little better in drama. They are referred to as “gentlemen of the road” and as tramps, despite their equal status to their equivalent women as misfits. George Orwell’s descriptions of homelessness in his book Down and Out In London and Paris opened eyes to the masses of men on the road in the 1930s, when millions were unemployed, but the notion of male homelessness was still given a nobility compared to Sandford’s Edna. 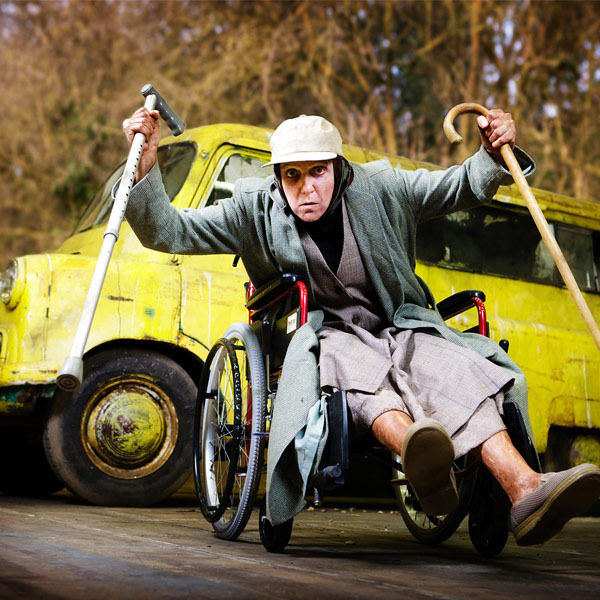 Johnny Rooster Byron in Jez Butterworth’s Jerusalem is not a down and out as he lives fairly comfortably in his caravan in the woods but he is about to be thrown onto the streets at any moment. Again there’s a status granted to him by the writer empowering him with an intelligence and cunning which confronts and defies society for much of the play – unlike Miss Shepherd. 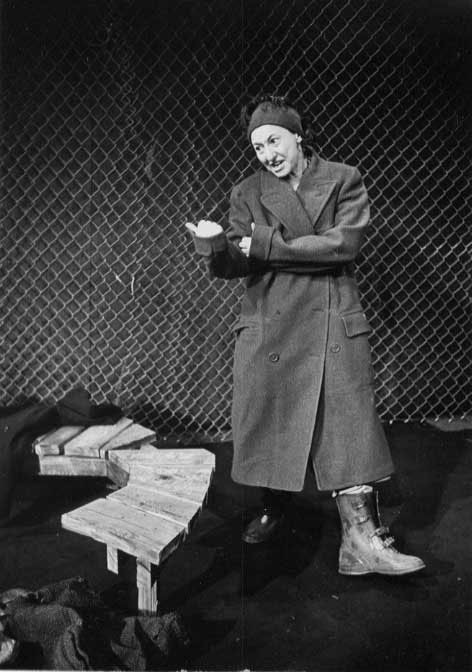 And perhaps the most famous tramps in drama Estragon and Vladimir in Samuel Beckett’s Waiting for Godot are philosophers whose existence is that of the gentlemen of the road. They are not supposed to be naturalistic, but entirely theatrical – unlike Miss Shepherd or Edna. Today there are still thousands of homeless women on the streets without a home, or living a semi-nomadic lifestyle – one week in a shelter or on a sofa, the next in a cardboard box. Drugs, drink, mental health, illness and hopelessness are all factors – and yet for many of us we feel that these women could turn their lives around if they hand a mind to do it. Which shows just how naïve we are. For these are complex people with impossible lives. 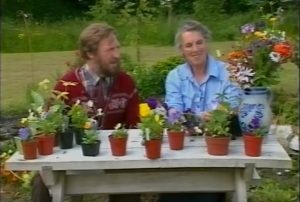 In the case of Miss Shepherd she was fortunate to arrive in Alan Bennett’s garden in her van as he did take an interest. But in the end you are left wondering perhaps who exploited who – the writer or the vagrant? Did Sandford exploit the homeless like Edna or highlight their plight? The Lady In the Van may not have any answers but it does highlight the lost lives of these women and how we view them today: partly with humour, partly with disgust and partly with pity. Romans conform to stereotypes. They ride scooters while texting, a cigarette in mouth and one eye on the traffic; appearing to have taken a course in looking cool at all times. Or they walk and talk in couples while emphatically gesticulating to each other, as they cross four lanes of traffic―oblivious to the concept of looking left and right. In contrast there are the visitors who are divided into two types. The independent ones go round on their own, in couples, or in small groups. And then the large shambling assemblages led by their leader holding an umbrella or a rolled magazine. In groups of 20 or more they follow in an untidy column listening to their tour guide’s notes―plugged into a running commentary of the history of the eternal city shutting out the traffic, graffiti and other groups of tourists. Whether they are shepherded through the narrow streets of Trevi to Nicola Salvi’s fountain to take selfies and toss a coin or three into the frothing waters or trail across the wide open spaces of the Piazza del Popola their sense of the herd remains intact. At the Colosseum in the early morning sunlight where young Bengali men with gleaming teeth try their hardest to sign them up to the yellow, red or blue open top coach tours they stay loyal to their guide. Ah, those national stereotypes: handy to use and which occasionally even contain a grain of truth. The Americans are fat with lots of cameras, the Chinese thinner with smaller cameras and the Japanese very slim with tiny cameras. The Poles smoke while the French talk constantly. And as for the Brits. Well… of course there were the chain store shorts, socks with sandals, and a look of constant hope in their faces of being able to discover a newsagent and buy a two day old copy of The Daily Mail or find a café that brews a real cup of tea. And I should know, as I was one of them. I had imagined a cottage in Ireland set amongst rolling green hills. I had imagined strolling down to a merry music-filled bar and downing pints of Guiness with friendly Irish locals. This was the image I had of my holiday last summer portrayed by the holiday company Imagine Ireland. On every page of the brochure were beautiful pictures of the perfect vacation. It was everything I had imagined Ireland to be. Oh dear. The deal: a week in a house in Waterford in the Republic. We knew it wasn’t a cottage overlooking a sandy bay as we’d seen it on the internet. We’d be staying in a modern house on a new estate with all mod cons. Which was fine. That’s why the price was lower than the neat crofts, elegant farm houses and holiday apartments depicted in the brochure. But it was in Waterford, and we knew the city famed for its crystal glasswear, was one of Ireland’s most fascinating places. Travelling by car with my wife Linda, son Lawrence and daughter Milly, we took the ferry from Fishguard, landing in Rossclaire and drove the short distance to Waterford. For years we had holidayed in Pembrokeshire, so the drive through Wales was familiar. The ferry crossing was peaceful and we arrived in Waterford in good time, just as dusk was falling. Imagine our shock as we followed the directions and found ourselves driving straight to the town’s rubbish dump and landfill site. We checked the address, but sure enough, the small estate was right next door to a towering hill of rotting garbage, and a mecca for thousands of seagulls. We parked and went into the house. The property was fine. It was a modern semi, well appointed inside with a new kitchen and comfortable beds. But the view of the landfill site was not what we’d expected, and a call to the Imagine Ireland did not achieve anything. They had not given us any misleading information they said. “Make the most of it,” we thought. “Afterall, we’re on holiday.” A sleepless night followed – caused entirely by barking dogs from next door. Their sound could only be deadened by keeping the windows closed on the hot August evenings – which at least kept at bay the flies attracted by the rubbish dump. The next morning, we discovered even more horrors. The landfill site was in constant use by lorries and businesses delivering rubbish or items for recycling. And the roads around were littered with offerings from fly-tippers: old fridges, bottles, binliners filled with kitchen waste and piles of building rubble. A walk around the block was not really an option. The friendly music-filled pub that lay 400metres away (according to the brochure) had steel grills over its windows, and had the impression of being a place under siege from vandals. We were located in the middle of an area of town that took in a large council estate, an industrial trading estate and the landfill site. But there was worse to follow. Around the corner from our road was an illegal gypsy site. Dozens of caravans were parked on the pavements and lawned areas by the local primary school. We knew it was illegal as there was a feature on the local radio station about the problem. The authorities had spend many euros attempting to get the gypsy residents to move to an official site, and there had been constant unrest between different gypsy families and people living in the area. On our first day we explored Waterford and found the historic centre of town to be an attractive and pleasant place. Yes, it was a little scruffy in places, but on the whole it was no different from most towns in England or Wales. It’s part of the charm of exploring a place, discovering the shops, investigating the attractions and taking in the atmosphere. But the atmosphere shouldn’t have included a riot. The second night in our holiday home was just as sleepless as the first. The dogs were barking as usual. But this time they were joined in a cacophany of police sirens, shouts, screams and gunfire. I woke up and looked out of the window. Something was definitely going on up the road, and there was the distinct smell of burning. I went back to bed feeling somewhat troubled. The next day I went for a jog before breakfast. Within a short distance the road was cordoned off by the police. There were police cars, firefighters, ambulances, and even a television crew. Up and down the street were strewn shoes, smashed bottles, burnt out cars, overturned caravans, burning tyres and all the debris of a battle. A house on the other side of the street was still smouldering, it’s roof having collapsed, and its walls blackened by smoke. “Oh my God,” I thought. I went back and got my camera, but it was difficult to get close to the scene as the police widened their cordon as it emerged that a man had been shot during the disturbance. Apparently, two rival gypsy families had fallen out and had declared open war on each other. Both had summoned re-enforcements and all hell had been let loose. The events were the main item on the television and radio news, and the local paper had images of the aftermath on the front page. So we did what any self-respecting family from England would do: we went for a picnic. In fact, everyday we went somewhere, as staying in was not an option. A daytrip to Dublin was wonderful, a walk around the JFK Arboretum was relaxing, and a visit to the enjoyably tatty seaside resort of Tramore was fine. We went for a meal, went shopping, went to the cinema and even went swimming in the sea at Youghal. In short we did everything we could think of to escape the war torn estate. We did complain by phone, letter and email. Eventually we received a letter and a voucher for £50 redeemable against our next holiday with Imagine Ireland. Imagine what we thought of that. RAPSCALLION MAGAZINE – FEATURE: Tilting at the political system: Don Corbyn Quixote of Islington North is laughed at by his rivals and opponents, but could he have the last laugh in 2020? In a constituency of Islington North, whose name I do not wish to remember, there lived a little while ago one of those gentlemen who are wont to keep a copy of Fo’s Accidental Death of an Anarchist or The Communist Manifesto beside him. His stew more lentil than meat, his talk more 1970s than 21st century, and his shirt more Help the Aged than Ben Sherman. Our gentleman of some 60 summers or more is of a sturdy constitution, but wizened and gaunt featured, an early riser and devotee of Diane Abbott. Jeremy Corbyn has something of Don Quixote about him as he tilts at the tormenting windmills of Owen Smith, Hilary Benn and Angela Eagle. Behind him are all the other characters from Cervantes’ novel: his faithful shadow chancellor John McDonnell, his housekeeper Diane Abbott, ancient retainer Dennis Skinner and unreliable stable boy Tom Watson. Armed with a mandate from members of the Labour Party the leader of the movement has mounted his sturdy steed Rocinante and with his lance Momentum has set out to vanquish the Conservatives. This mixture of the dangerous, reactionary and wicked Tory inn keepers, Toledo traders, Galician pony dealers and muleteers may laugh at him during Prime Minister’s Question Time each Wednesday lunchtime and criticise his archaic view of Britain, but privately are frightened of what he represents and mercilessly attack him because they know that if the economy dips he could become the master of Seville. David Cameron and Teresa May, The Daily Mail and The Daily Telegraph, had ridiculed his ideas but somehow the barbs don’t deter him. In fact armed with his lance, his buckler and home-made visor he is more determined than ever to sally forth and seize the Castile Number 10 Downing Street. As with Don Quixote it is not so much the Conservatives, the Scottish Nationalists and even the Liberal Democrats who stand in his way but members of his own party (or in Don Quixote’s way those members of his household) who feel he will never win even the most minor battle in his bid for glory. Those within the Labour Party who wish he would hang up his buckler see him as a misguided and out of date old fool – just like Cervantes’ hero. Mr Corbyn however constantly points to his fans, and to the vast new membership of the Labour Party who joined up to support his two leadership bids. But they are surely the same as those readers who bought Cervantes’ novel when it was published. They supported him from their bedrooms and living rooms as they read of his exploits. Queued up for his book signings (if they had them in Spain’s Golden Age) and if was alive today would hang his every word like someone else with a beard and the look of a Biblical prophet. His only true fans in Parliament are his faithful servant Diane Sancho Abbott who follows him where he treads. Like Sancho Panza she is often left to clear up the misunderstandings and chaos that Don Quixote leaves in the Inns of Catalonia or the dusty highways of the high Sierra as he comes to blows with herders, traders and members of the clergy. The duo cross the verdant plains of Middle England in search of electoral victory, tilting at windbags and dreaming of rescuing Princess Maritones or Rebecca Long-Bailey from the back benches. 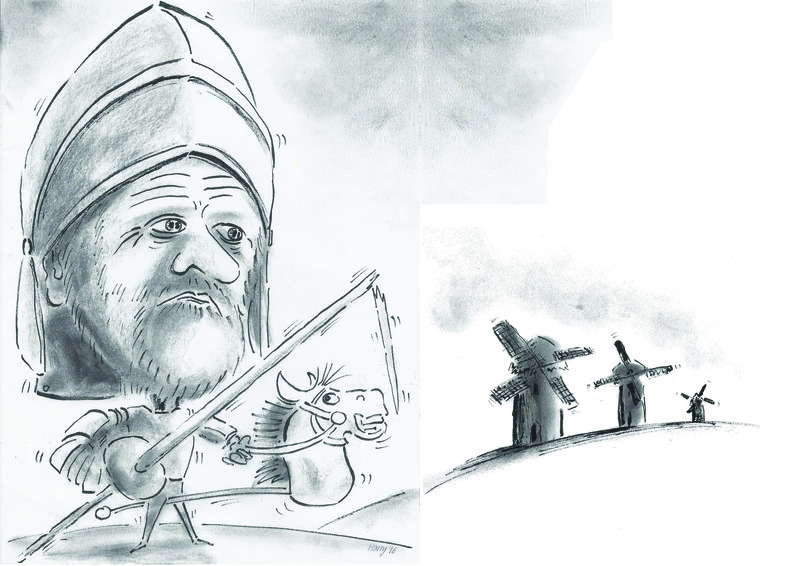 Mistaken as a mystic, a fantasist and a hopeless and ineffectual leader by a large group of goat herders, nevertheless he believes he can heal the wounds of muleteers with his balm of Fierarbras and return them to health in 2020. Jeremy Corbyn looks like Don Quixote – well like Jean Rochefort in Lost in La Mancha. And he has a passing resemblance to David Threlfall who played the self-proclaimed knight in the RSC production. And there is something attractive about someone who sticks to his principles (or fantasies if you are a cynic) despite all the evidence presented by his critics. Corbyn it is said rejects the modern world and wishes to turn back the clock to a long lost never was time when the trains were nationalised and ran on time, when the National Health service was fully financed. It is generally agreed by pundits in America that the equivalent politician Bernie Sanders could have beaten Donald Trump in the presidential election had he won the Democratic nomination. Clearly millions were prepared to give him the chance to run the world’s most powerful economy because of the disappointment felt over the last few administrations. If Teresa May and the Brexit hardliners in UKIP and the conservative party fail to make a success of leaving the EU and the country falls into a recession or worse, then in 2020 Don Corbyn de Islington may not seem such a fantasy. 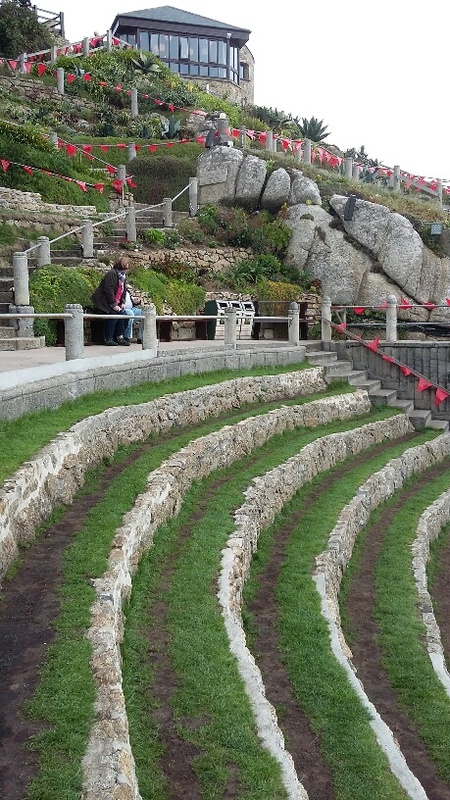 One woman, one gardener, two handymen and three decades of lifting rocks have seen the Minack Theatre emerge from the cliff tops above Porthcurno beach. Rowena Cade began the work of creating the open air amphitheatre in Cornwall in 1931 when she decided it would make the perfect venue for a production of The Tempest the following year. Since then the rocky creation has seen countless plays and musicals despite a lengthy interruption for the Second World War when the area was damaged by the Ministry of Defence as the bay was barricaded against enemy invasion. The most striking thing about the theatre after the dramatic view is taken in is the steepness of the steps and stairways. Elderly visitors (and particularly the very large ones relying on walking sticks) have a challenging descent down to the performance area. Particular enjoyment is to be had by the more sadistic visitor (of which of course I am not one) of sitting at the bottom of the theatre and watching the immense difficulty the infirm and unsteady have in managing the steps. In 1931 there was no such thing as health and safety regulations, and it is hard to imagine the planning bodies allowing the construction of such a precarious theatre today. Unfortunately when I was there nobody fell over. Which is just as well as the hospital in Penzance is several miles away along a narrow and twisting lane. However I can imagine there’s been a few mishaps with dodgy knees and wobbly ankles during the shows at night when rain may have made the steps slippery. Then the dram would have been in audience rather than the stage as real blood – not theatrical blood – is spilt. I must hasten to add these macabre thoughts are not mine – but those of my friend Trilby – and must obviously distance myself from his blood thirsty sentiments. Well done to Rowena Cade for providing such a dramatic stage and its potential for hospitalising frail and doddery visitors. There’s more in Rapscallion Magazine at www.harrymottram.co.uk – follow Harry on Twitter and Facebook, LinkedIn, YouTube and God knows where else.